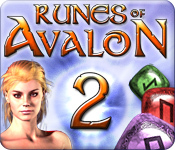 ← Runes of Avalon 2 reviewed by Gamezebo! For each match of three or more runes you earn the same amount of Rune Magic (as long as there is an opened vial corresponding to the runes you matched). When you make a match of 2 colours (COMBO) you’ll receive 3 spells. When you are short on time, focus on the colours that are missing. It’s easy to waste time making matches for colours with vials that are already full. Take advantage of chain reactions – make matches for spells that will activate other spells in turn (such as bomb, fire, vanish and drain spells). Drop spells from the Amulet of Spells in places where they will collect as many runes as possible and activate as many other spells as possible. For example, do not drop the fire spell onto another fire spell, but to one side – this way you will collect more runes, because you will have two flames of fire instead of one. Be careful with the teleport spell. If you have already planned all your moves carefully it can ruin your strategy, however, if there are lots of runes on the board with no pattern, it can make matches at random. Try to get as many points as possible in the rune matching game – every spell earned during this mini-game will show up on the board on the next level and will make it easier for you to complete it. In the puzzle mini-game, when you swap pieces you can see the original picture under the flying pieces. Watch for it and it will be easier for you to make the right swap. You can view all completed images in the puzzle mini-game in the gallery. You can even replay the puzzle game with the selected image on any of three different difficulty settings. Colour Drain Spell – this spell removes all runes of one colour from the board. Teleport Spell – switches rune colours randomly. It also affects stones and locked runes. Spread Spell – turns the surrounding runes into the same colour as the rune you dropped it on. Learning how to use this spell effectively is crucial to completing some levels. Each spell uses 5 Rune Magic points. Some spells can be cast with either one of two available colors ? in that case spell uses the one that has more points collected. Note that the Double Fire Spell can be tricky. It casts 2 cross fire spells, but not at the place you drop it. One fire spell is cast to the left and above and the other one is cast to the right and below. Regular levels – your task is to fill magic vials with corresponding rune magic (colours). Rainbow runes levels – the taks is to collect all rainbow runes. The trick is that those runes are not draw so you can not make regular matches with them. You need to use spells. Place as many spells as you like on the backdrop and then release one spell (preferably vanish spell) and watch what how all the runes disappear. Giant Rune levels – you need to collect all Giant Runes to progress. You collect a Giant Rune by placing 2×2 sets of regular runes on each side of the giant rune. Puzzle mini-game – in order to advance to the next stage you need to complete a puzzle minigame. Swap pieces until they lock into the right places. Feel free to submit your own tips & tricks. This entry was posted in Anawiki Games, Runes of Avalon. Bookmark the permalink. I’m playing on a Mac. I keep running out of time on level 11, Any help? Stevo, you need to use spread spell. Use it a lot to speed up collecting runes. Without using spread spell it is really hard to complete level 11. Thanks for your reply. It’s a great game and I’ll keep trying. I think I may be at a disadvantage in that I’m using a track ball because it has a right and left button , but the Mac mouse does not. I think having to move the track ball slows me down, would you agree? I’ve never used a trackball so I don’t know, but that very likely to be the case. You can try to use keyboard instead (arrows, space and enter).